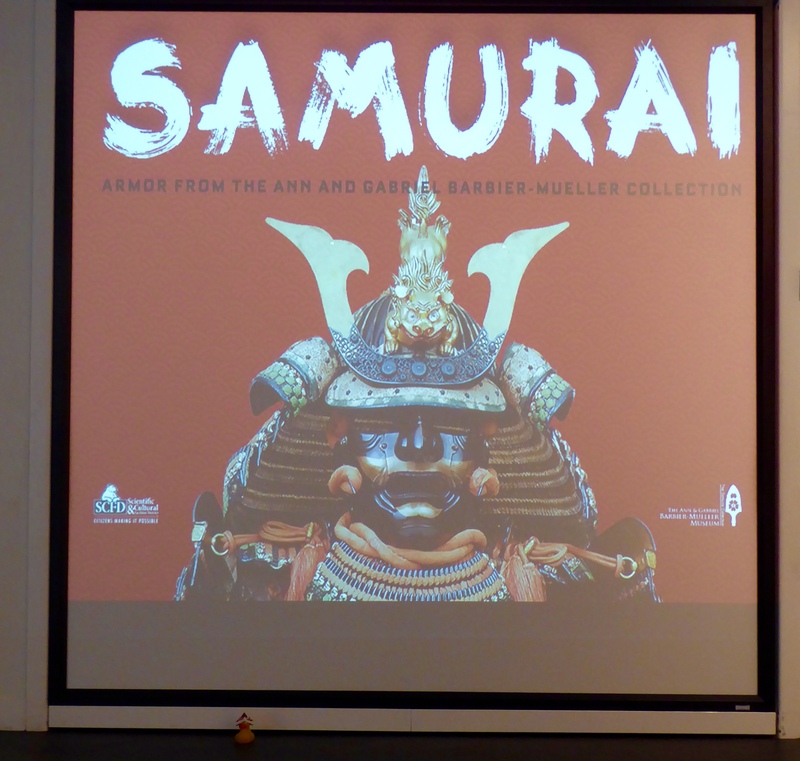 Between the late 1100’s and the late 1800’s, the Samurai controlled Japan. The samurai formed the top tier of a strictly hierarchical society. 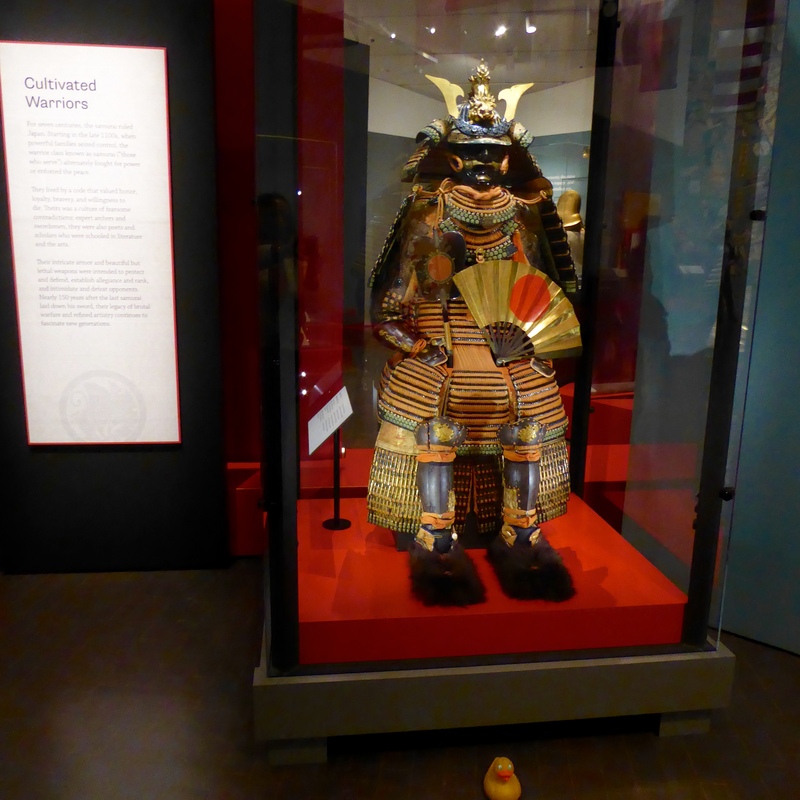 And, I, Zeb the Duck, am at the Denver Art Museum exploring the special exhibit about The Samurai. Look at this suit of armor. It looks too heavy for a small duck to wear. But, who were these Samurai? Good guys or bad guys? They were the good guys. 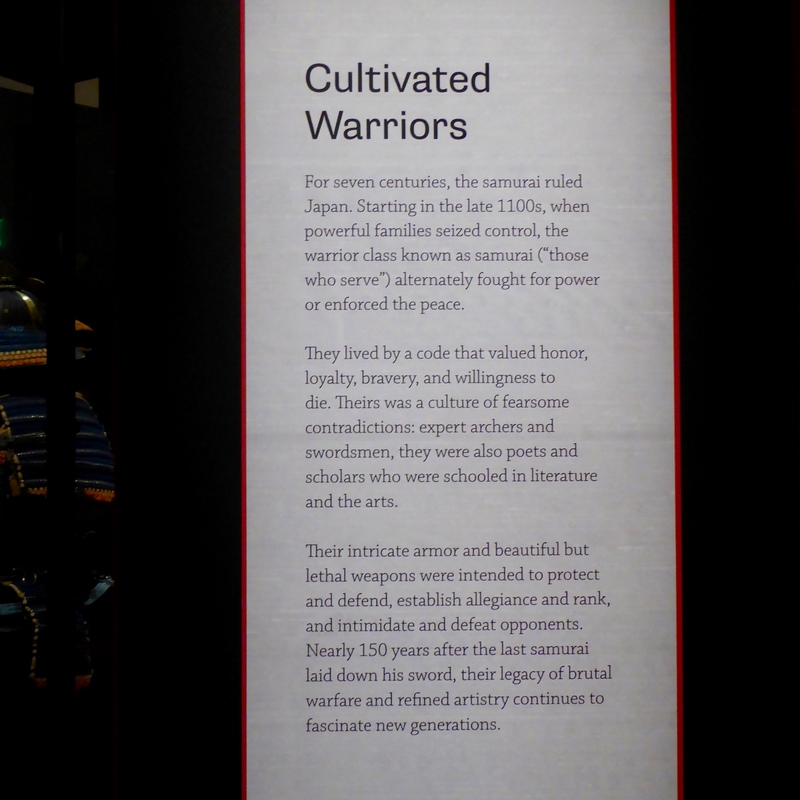 They were great warriors, but also very educated. They were trained to be exceptional gentlemen in all phases of life. They had to keep their lives balanced. The boys of the Samurai families began training when they were about 6 years old. They were given their first wooden sword to begin training. They also became skilled in martial arts, learned history, classical literature and calligraphy. The boys earned the first suit of armor when they were about 12 years old. 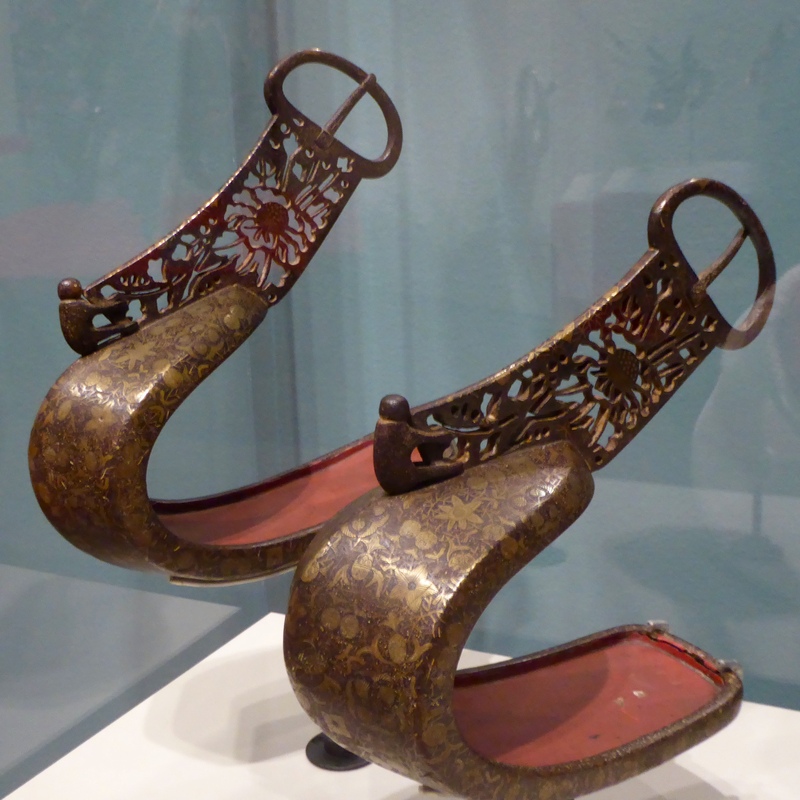 This one, from the 1800’s, is of iron, lacquer, gold, wood, lacing and fabric. I liked this silk screen. 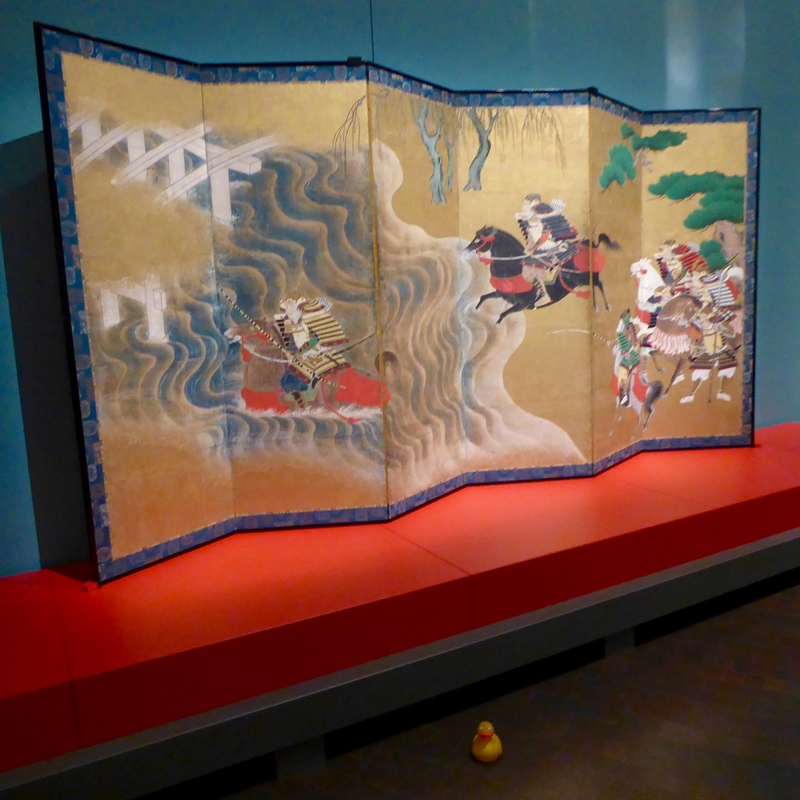 It recounts an episode during the Genpei War (1180-85) when the Minamoto family’s defeat of the Taira family ushered in the era of Samurai rule. 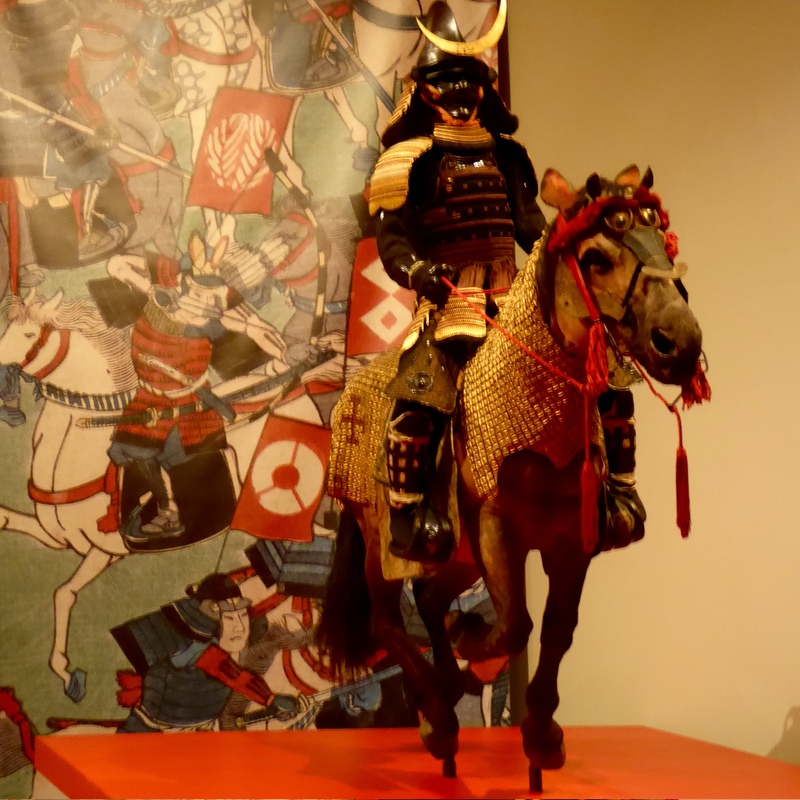 This Samurai warrior looks very formidable on his horse. 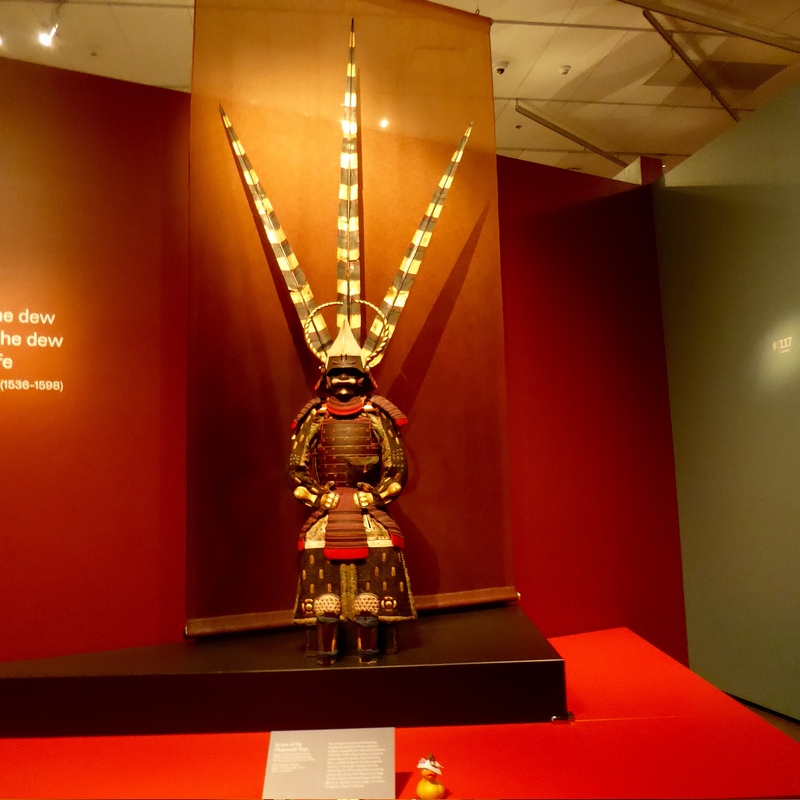 He is wearing armor of the Tachido Type from the 1600’s made of iron, gold, lacing, bear fur, silver, and wood. His horse is wearing armor with a horse mask from the 1600’s or 1700’s, made of leather, wood, silk, lacquer, fabric, gold, and horsehair. The horse tack from the 1600’s or 1700’s is also made of leather, wood, iron and lacquer. Stirrups were very important. These are of iron, wood and copper. Notice the seated monkey at the front of each stirrup. Monkeys were considered to be protective figures for horses and were often housed in stables alongside horses to keep them calm. The Samurai men were often away fighting, so the women were trained to defend themselves and their homes. 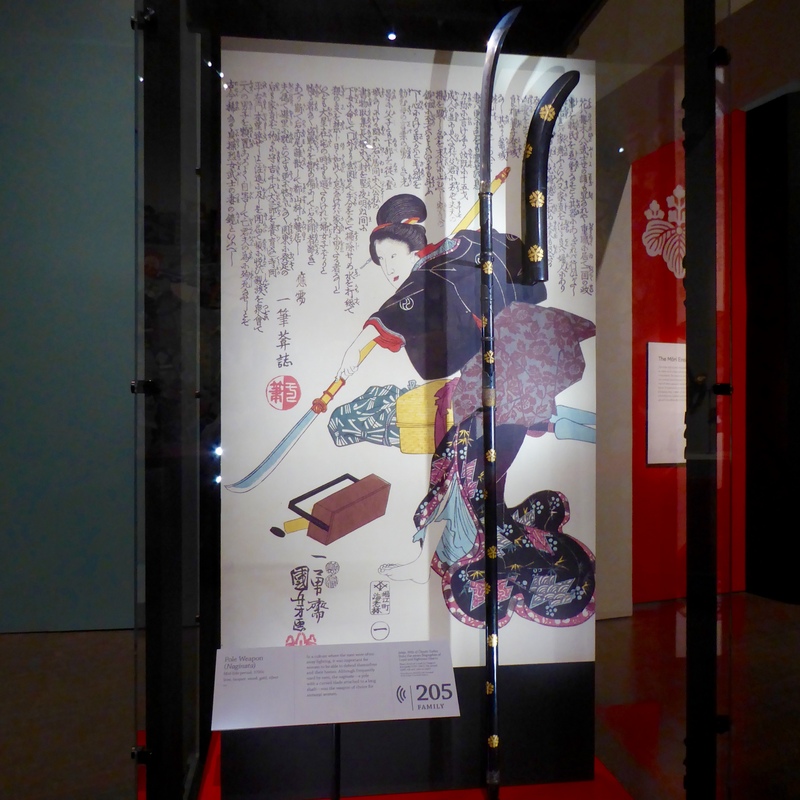 She is using the naginata, a pole with a curved blade attached to a long shaft. This was the weapon of choice for Samurai women. Horse masks were often made of paper maché, but not this one. 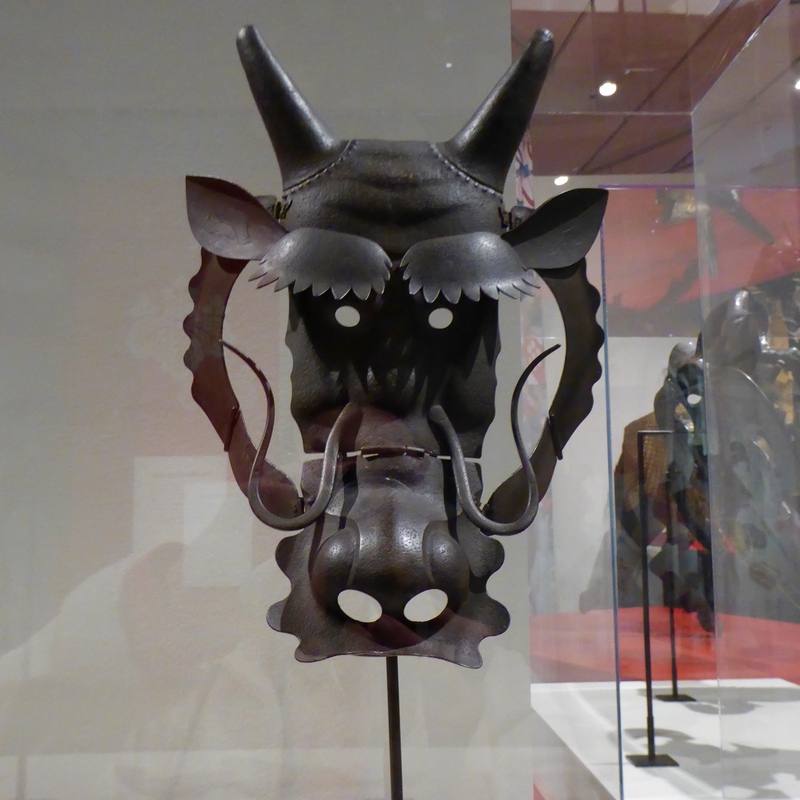 This is a rare example of a horse mask made of iron. The mask, often worn in a parade or procession, transformed the horse into a creature of mythical power. Here is the Mōri Ensemble. 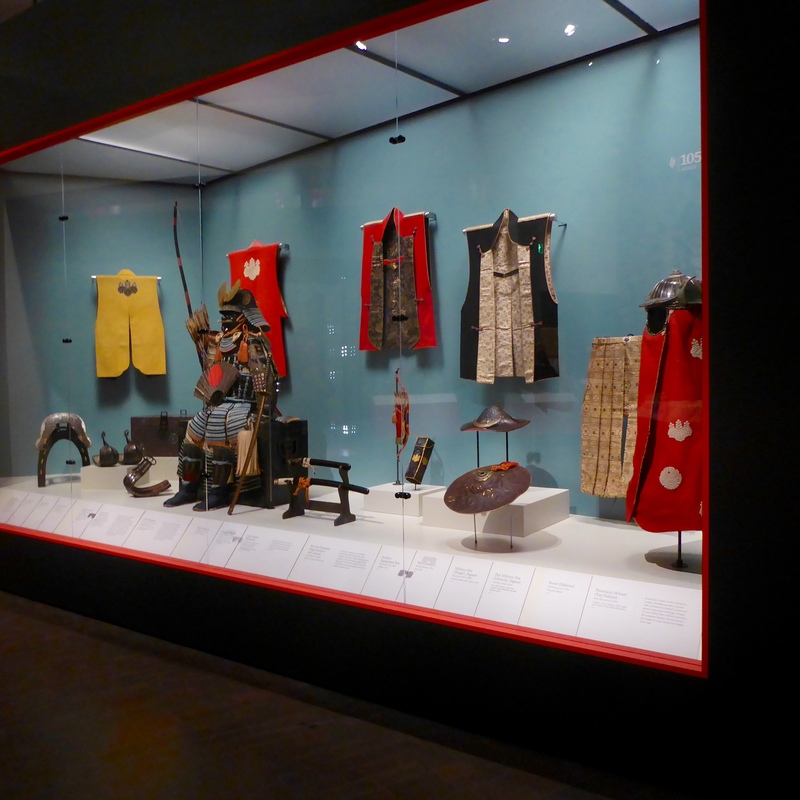 You are viewing the only known example, outside Asia, of an entire set of armor and accessories belonging to one family. 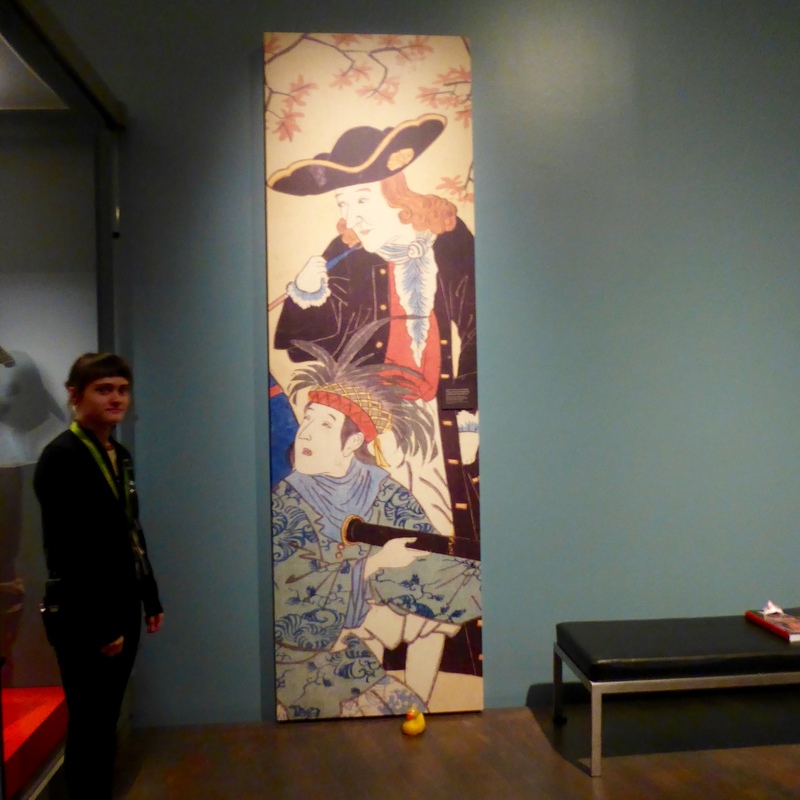 This panel shows daily life of a samurai. The docent near the panel is my new friend. You will notice I am in front of the armor and I am wearing a samurai hat. Made of iron, lacquer, bear fur, paper, bamboo, gold, wood, fabric and horsehair, this is very fancy. 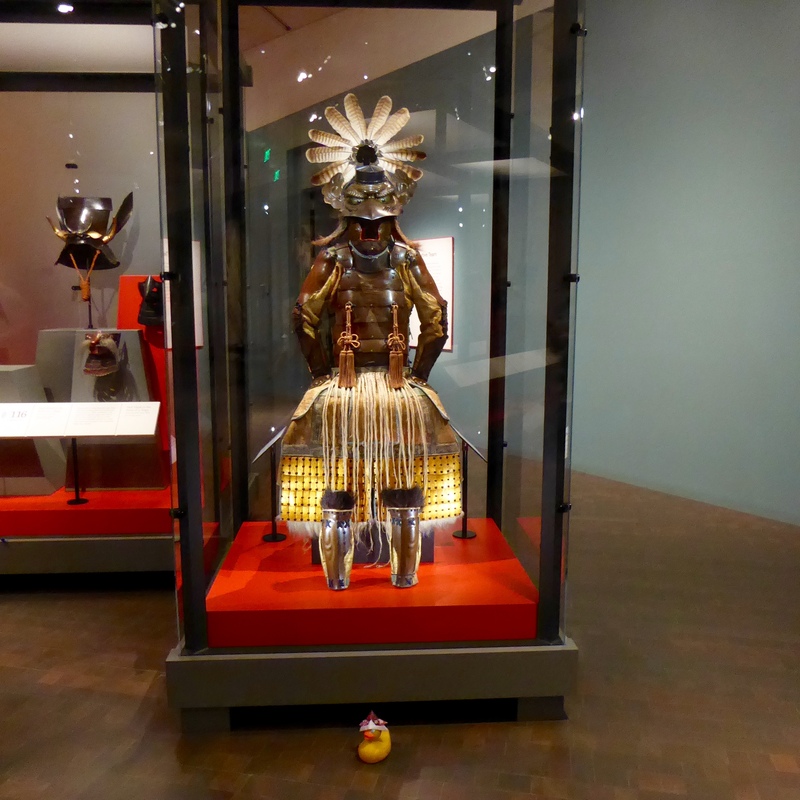 My humans and I really liked this exhibit. Since it is a special exhibit, it will only be at the Denver Art Museum until June 5, 2016. If you visit this exhibit, you will like it. There is so much to learn and so much to see. Of course, I could not show you everything. When you enter the exhibit, you receive an audio guide that will explain various displays to you. We really like the audio guides that we use for special exhibits here. We hope to see you there soon. 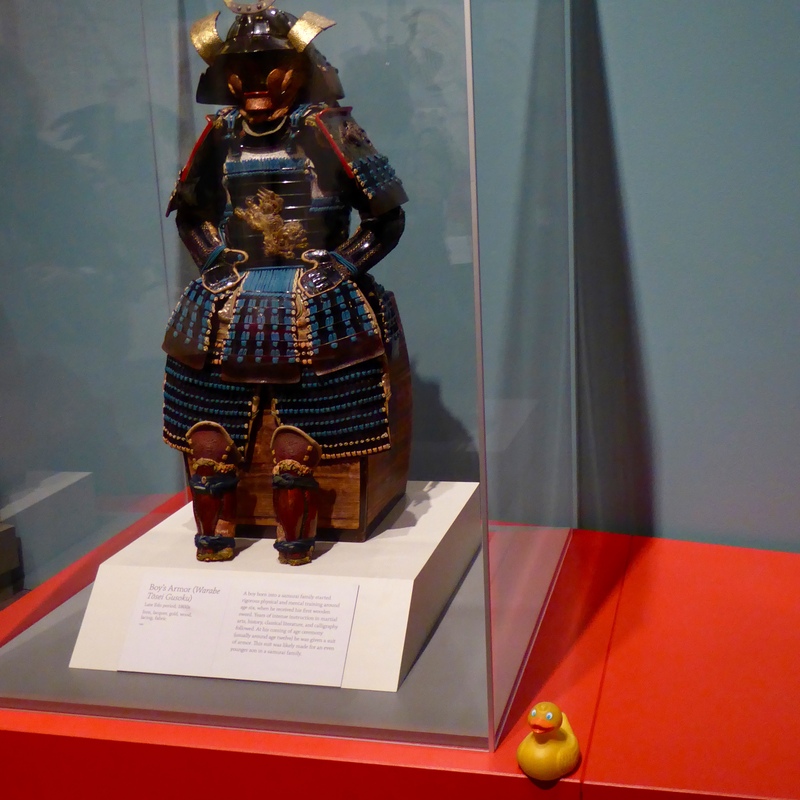 This entry was posted in Colorado, Uncategorized and tagged Colorado, Colorado Traveling Ducks, Denver, Denver Art Museum, horse mask, naginata, Samurai. Bookmark the permalink. This was an amazing exhibit. So glad we were able to see it. I also enjoyed it. Not sure if horse mask or monkeys on stirrups impressed me more. Thanks for reading and commenting.